I work from home most Fridays and that experience (no commuting or multiple meetings) usually provides a nice segue to the weekend. My responsibilities have ramped up in recent weeks and Fridays have become a blessing in terms of catch up time. Except for yesterday, where I started at the crack of dawn and didn't stop until close to the crack of dusk. My one concession to the Friday workday madness was to break away for a short time to do a neighborhood run. Once I was satisfied that I addressed some overnight business issues, I quickly changed into running gear and headed out the door. The humidity and temperature were both surprisingly low and I looked forward to a pleasant experience. It's much nicer running on Fridays without buses and school drop-off traffic. But the recycling manics remain. These guys drive their ten ton truck around my neighborhood streets like it's a Porsche, exceeding the posted speed limit by 20 MPH and ignoring stop signs. Whenever I hear the roar and rattle of the truck, I make a beeline to the sidewalk. Even though there are 5+ miles of road in the neighborhood, I always end up encountering them at some point on my route. Except for the truck, the run went fine. I had some slight breathing issues when I tried to push my pace, and I'm thinking that my aerobic threshold may have dropped over the last couple of years. If that's the case, it would explain my measurable reduction in speed. I had hoped last weekend's intervals would have gained me some improvement, but perhaps a mile of repeats at around 92% of max heart rate was not enough to make an impact. Even with decent weather, I ended up feeling depleted. I had a fast shower and then it was back to work for the rest of the day. 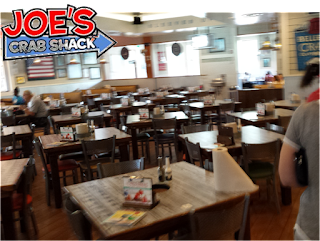 We had planned a family dinner last night at Joe's Crap Crab Shack which recently opened in our area. We'd gone to one in Orlando years ago and had a great time. We all looked forward to this dinner. I don't know if I happened to be getting sick (perhaps my hard run and the long day standing in front of my laptop were responsible), but by the time we left the restaurant, I was feeling awful. The experience at Joe's was interesting. 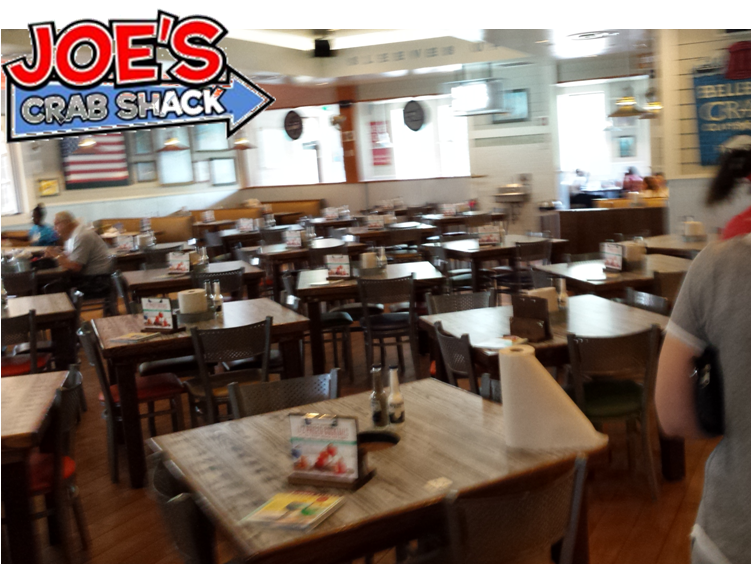 Here is my recommendation: Don't eat at Joe's Crab Shack. At least don't eat at the one in Westbury, NY. We arrived at the place before the busy hour and although the room was more than half empty, we were told we'd have to wait for a table because they didn't have enough servers. My wife wanted to leave, but we were all hungry and chose to stay, since they managed to "find room" for us in the back. This back area resembled the dining room of a highway truck stop circa 1973. The photo at the top shows the room full of invisible diners we needed to walk through to get to our table. The greasy fish I had was terrible and no one else liked what they'd ordered. By the time we got home, I was feeling sick and had to lay down for a few minutes. I rallied enough to go out back for our Friday night fire pit and even managed enough of an appetite for a S'more. We have seen some interesting things on these nights, like an extremely porcine raccoon "sneaking by" atop the fence. Last night we were again dive bombed by a bat, who perhaps thought the pool was a pond. This morning I was time-pressed because we had an early appointment at a local college. I probably could have fit in a short run, but I was still feeling iffy and decided to do today's workout on the elliptical. Despite my opening windows on both ends of the room for air flow, it was humid as heck. Even so, the workout was pleasant. Some people don't like the elliptical, but I do, mostly because it's not a treadmill. Tomorrow I'm heading to Massapequa Preserve to meet up for a Runska-run. I'm hoping that I'll be in ready shape for the six miles I plan to cover. 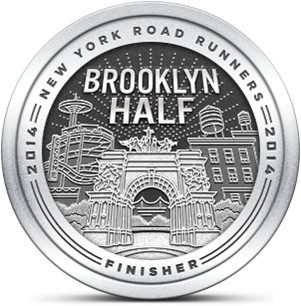 The heat and humidity are supposed to be off the charts, so I'm not planning to do these miles very fast. I I was thinking about getting a fire pit in our back yard. My buddies and I loved hanging out at the hotel fire pit every night with some vino in Santa Fe. I thought it might be too dangerous with the 3-year old. Maybe we can just come over to Plainview and use yours!? Yes, by all means, come to Plainview! Fire pits are awesome, but I would be cautious with the little ones. Especially if you're serving them vino. All those family restaurants are the same - awful. Sounds like a tough weekend and it's only Saturday!